0 D A Y S T O G O ! Music & Elsewhere are proud to present a celebration of the 25th Anniversary of their first release, way back in 1992. This special collection, presented in a double Amaray clear case, contains some of the best, most original and interesting music (and elsewhere) we ever had the honour to release, featuring 30 bands / artistes from 30 countries, spanning the 5 continents of our United World Underground. 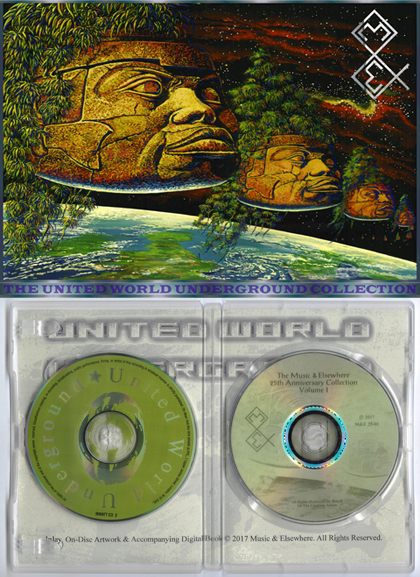 The set consists of a data disc (DVD-R) containing 30 albums (mp3 format at an ear-pleasing 320kbps), 50 bonus tracks, 3 books (PDF format) and an accompanying 64 page illustrated booklet (also PDF format); plus a CD of the original UWU compilation from 2001. There's 33 hours of underground sounds in all, plus a whole lot more, and all at the very affordable price of only £15 GBP, with the added bonus launch special of free p&p for everyone!